Safe access to water for drinking is a central target in the UN Millennium Development Goals-MDG (Target10: to halve by 2015 the proportion of people without safe access to drinking water). The stark fact is that in India 80 per cent of the population simply lacks access to safe drinking water, 700 million people living in villages, and the 200 million or so who constitute the urban poor lack access to safe water. The United Nations claims each person needs minimum 30 to 50 litres a day for their needs. Presently we are heading towards lack of access to safe water supply mainly due to improper management of water resources and environmental degradation.The number of wells drilled for irrigation & industrial use has rapidly and indiscriminately increased. Intense competition among users like agriculture, industry, domestic sectors etc. is driving the groundwater table lower. Uncontrolled use of the bore well technology has led to the extraction of groundwater at such a high rate that ground water recharge is not sufficient to meet the extraction. Every one is extracting more and more quality water from aquifers. In case, an aquifer with saline quality is met with, then water from it is not lifted thereby the area of saline & brackish water remains on an increasing trend. For any living society, existence of groundwater is important as it forms a major source of drinking water in both urban and rural India. For supplementing almost all the water needs of the country, groundwater is most important water resource. Groundwater constitutes remarkable per cent of the freshwater. It is almost universally available in nature, with variation in levels, quality and quantity. It is a common property resource as no single person or organization can own it. Groundwater is relatively easy and cheap to use. Approximately 80% of the community water systems providing drinking water depend at least in part on ground water. A significant number of surface water drinking water sources are also dependent on ground water during periods of low flow. Many people in area depend on ground water from private drinking water wells. In India seventy per cent of all available water is considered polluted. It has been estimated that approximately 73 million working days are lost due to water related diseases. The cost of environmental damage is estimated to be over 5 % of India’s GDP. India currently generates over 110,000 million litres of wastewater a day, and over 12,000 tones of hazardous waste is dumped on surface.The most accessible fresh water is stored in shallow geological formations called aquifers and is most vulnerable to contamination. These aquifers feed our lakes; provide recharge to our streams and rivers, particularly during dry periods; and serve as resources for 92 per cent of public water systems. 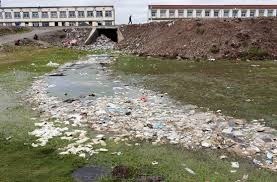 The most responsible polluter is City SEWAGE. Pollution of groundwater resources has become a major problem today. The quality of groundwater is getting severely affected because of the widespread pollution of surface water & discharge of untreated waste water directly in to natural drains & in Dry bores adopting unscientific disposal methods, thereby reducing the quality of fresh water resources. The WHO reports that 25-30% of all hospital admissions are connected to water borne bacterial and parasitic conditions, with 60% of infant deaths caused by water infections Contamination of fresh water has led to increased incidences of cancer, developmental abnormalities and death. Pools of stagnant dirty water, both in rural and urban areas, account for a large number of deaths caused by potentially fatal diseases like cholera, malaria, dysentery and typhoid. Nitrate concentration in water above 45mg/l makes it unfit for drinking by infants. The nitrates are reduced in body to nitrites and cause a serious blood condition called the "Blue Baby Syndrome". A higher concentration of nitrate causes gastric cancer. Pollution pathways can affect water supply from Ground water. Consumption of Polluted water leads to the following health hazards. Sewage is a dilute mixture of the various types of wastes from residential; public and industrial places. Sewage contains more then 90% of water and small portion of solids present, undergo changes by bio-degradation causes nuisance and pollution. So an Understanding the nature of physical, chemical and biological Characteristics of sewage is essential in planning, design and operation of treatment and disposal facilities and in the engineering management of environmental quality. The strength sewage is its potential to produce nuisance to the man & environment. It is expressed in terms of B.O.D. The nuisance is caused by the unstable oxidizable organic matter, which is in nature, undergoes biodegradation produces very bad odour and causes in sanitary and unhealthy environment. If the sewage contains more organic matter it is stronger and if the organic contents are less it is called mild sewage. The standards are set with the assumptions that the environmental media have the capacity to assimilate the pollution load so that no environmental problems will arise. When industries withdraw large quantities of water for their use and/or discharge almost equivalent amount as wastewater, they cause an “externality” problem to other users. Few factories deliberately inject untreated effluents directly into the ground, contaminating underground aquifers just to reduce treatment cost. Samples of groundwater were collected from eight places and tested for concentrations of some known pollutants Disposal of treated and untreated industrial effluents on land has become a regular practice for some industries. continuous disposal of industrial effluents on land, has led to groundwater pollution Ground water quality of shallow open wells surrounding the industrial locations has deteriorated, at some locations drinking water wells (deep bore wells) also have high concentration of pollute salts , toxic agents, acids. Having the option to dispose effluents on land, industries get encouraged to discharge their effluents either on their own land or on the surrounding farmlands in the hope that it will get assimilated in the environment through filtration, seepage and evaporation without causing much environmental hazards. However, continuous disposal of industrial effluents on such lands leads to percolation of pollutants to the groundwater through deep seepage and leaching, causing contamination. Disposal of treated and untreated industrial effluents on land has become a regular practice for industries. continuous disposal of industrial effluents on land, has led to groundwater pollution Ground water quality of shallow open wells surrounding the industrial locations has deteriorated, to an extent that drinking water wells (deep bore wells) also have high concentration of pollute salts . As a result, farmers in the adjoining areas find the ground water unsuitable for irrigation, and not fit for cattle drinking. Even the drinking water wells get affected and create local/regional environmental problems. Injection of Industrial untreated fluids can potentially contaminate aquifers that supply drinking water to households and public water systems. This is becoming a major problem in various villages surrounding Industrial towns as injection into a drinking water aquifer or injection into a zone that is not isolated from a drinking water aquifer contaminate ground water. Disposal of industrial effluent on designated land area as permitted by pollution control boards requires more attention as it plays vital role in deteriorating ground water quality and increasing incidence of water borne diseases (Vector borne-by increase of moisture & wet land area supporting mosquito breeding e.g. Malaria, dengue and Vehicle borne diseases like Diarrhoea, typhoid, hepatitis) & health hazards of skin infections etc. to surrounding rural population & Animal health. It is thus important that any disposal of effluent on to the ground to allow percolation beneath must be permitted only after the area is encased from all sides by building an underground grout barrier so that effluent can not travel beyond it to reach good aquifer. Industrial wastewater contains toxic chemicals. Industries normally dispose of untreated toxic waste into nearby drains, rivers. In Rajasthan Pali, Bhilwara, Balotra, Sanganer are suffering major pollution loads into water bodies, rivers and under ground dry shallow aquifers thereby damaging the ecosystem of the area. 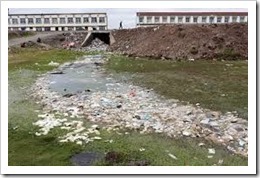 Apart from effluents, during the rainy season industrial wastes (solid wastes and solid sludge of the effluent treatment plants) also end up in the groundwater as non-point source pollution, as they are openly dumped within the premises of the industries. The concentrations of pollutants in that sludge are comparatively higher than the effluents. As a result during post-monsoon season period groundwater pollution is expected to be as high or higher as compared to pre-monsoon period, so it is to be noted that point sources can act as non-point source. Water quality problems related to the disposal of industrial effluents and city waste on land and surface water bodies, are generally considered as a legal problem and at times develop public unrest creating law & order problems instead of just violation of environmental rules and regulations. To check this trend, more specific and transparent laws are need. Recharging Water aquifer without proper cleaning, filtering, and leaching of pollutants from industrial waste, Chemicals, acids, resins ,pesticides and fertilizers, municipal solid waste etc. transmits into the aquifers which pollutes the groundwater supplies marked by excess fluoride, arsenic, iron, or the salt water. Because contamination of ground water can be very persistent and difficult to remediate, it is important to ensure that contaminants do not enter ground water. According to UNDP study (2003), “Although groundwater is not easily contaminated, once this occurs it is difficult to remediate, and in the developing world, such remediation may prove practically impossible. When Ground water recharge systems are properly sited, constructed, and operated with provision of filters, underground injection is an effective and environmentally safe method to dispose of wastes. · Awareness and Public Participation – There is a need to create more awareness regarding the adverse consequences of effluent irrigation among different stakeholders (industrialists, farmers, concerned government departments and NGOs). Collective efforts towards pollution management are required. At places local NGOs have been raising the issue in various forums, but have not been able to find a solution to the problems faced by the farmers. Some studies co- relate average agricultural income for the samples having different EC concentration < 1.5dS/m. · Public Participation – The solution is to involve the local people and civil society in checking further pollution of our groundwater as they are the most important stakeholders and are the worst affected by pollution. This is all the more important in light of the fact that once polluted, cleaning up groundwater is next to impossible. It is a tough task for our bureaucratic establishment, which completely lacks transparency. · Priority to Water Harvesting & Recharge – Water Harvesting & Recharge structures can be developed in the campus of Factory or a Common Recharge system should be developed by joint involvement over a piece of land specially reserved for such activities, This way industries which are presently only on taking hand consuming ground water lifted from individual wells by hiring of tractor/trucks will move to a giving hand by improving ground water table in the area. · Fulfilment of Corporate Social Responsibility (CSR) – Every Industry should invest more in corporate social responsibility CSR – activities for developing artificial recharge after proper scientific designs in nearby villages by re-charging existing wells of farmers/ Drinking water tube wells & adopt schools for developing roof top rainwater harvesting – storage /Recharge systems & helping in developing potable water access to villages/ animals suffering from industrial effluent discharge. Since the high TDS concentration is the major problem in both the textile industries, these units need to decrease TDS by reverse osmosis (RO) or other technologies. Industries can also reduce the pollution load in their effluents through cleaner production technologies which consume less water and chemicals. · Adoption of New Technologies by Industry – Industries must resort to Zero – Discharge techniques, Water Reuse & conduct of periodical water Audits. Industrial water use is on ever increasing trend and by 2025 it may cross 20% of freshwater withdrawals. So industries should invest in achieving better water efficiency, in addition to reduction in water consumption and pollution load to the environment, & more recycling and management of freshwater conservation. Industrial water reuse & enforcing water audits have manifold benefits. · Adopting Underground Injection Control (UIC) Program – There is a necessity of adopting Underground Injection Control (UIC) Program like that of USA. The most suitable solution for current water crisis is to adopt techniques of Rain Water Harvesting (RWH) & Ground Water Recharge (GWR), as both these are low cost and complementary solution to the rising water crisis. However, before adopting this technique, it is very necessary to ascertain that whatever recharge is injected in to the ground is free of all hazardous contamination. Polluted water if once percolates to ground, it deteriorates the entire safe quality water and it requires heavy expenses as well as centuries time to get rid of such induced contamination. The techniques of ground water recharge are to be tackled with at most care so as not to permit any polluted water to percolate to aquifer. This entry was posted in ENGLISH SECTION (अंग्रेज़ी प्रभाग), Environment, Technical Articles, Water Management and tagged drinking water, ground water, pollution, status of pollution. Bookmark the permalink. Thanks for sharing your thoughts on drinking water.